Twenty-ninth round of elite German football championship is on and this match will be something special as it is great opportunity to place our bets and collect some cash. Wolfsburg plays away against Freiburg. These teams played more than few times and host recorded two wins and four losses. In last match result was 0:3 and average number of goals is under 3.5. Freiburg is in fourteenth place with six wins, twelve draws and ten losses. In last round they played away match against Schalke and after ninety minutes of play they went home with empty pockets. In first half of the match, hosts were slightly better but they failed to score. Referee awarded penalty to Schalke in sixty-third minute and that’s 1:0. Only ten minutes later they scored once again and that goal decided winner of the match 2:0. Nils Petersen will miss next match because he earned two yellow cards. Freiburg collected five victories, six draws and three defeats. Average number of goals in their home matches is 1.8 which is second lowest number of goals at home in the league. Their next rival is Wolfsburg and currently they play football of suspicious quality so this may be great chance for Freiburg to earn new points. Wolfsburg is in fifteenth place after twenty-eight rounds. They played away match against Hertha in last round. Wolfsburg came to Sinsheim with an idea to defend draw and they returned home with one point. First half of the match went without true excitements. In second part we have seen some attempts on target but nevertheless match ended 0:0. Wolfsburg has two wins, seven draws and five lost games as visitors. Average number of goals is 1.9. Next rival is not much better than Wolfsburg but they have advantage of home ground. When these teams play the most often outcome is draw and according to their current forms, it is also the most likely outcome. Enjoy in great football match Freiburg vs. Wolfsburg and try to earn money with our football prediction and betting tips. Have a good betting week. Freiburg have several missing players for the match against Wolfsburg. Florian Niederlechner, Mike Frantz, Amir Abrashi, Yoric Ravet and Caleb Stanko are injured and they will not play on Saturday. All other players are available to play. On the other side Wolfsburg have more missing players for this game. Jakub Blaszczykowski, John Brooks, Marcel Tisserand, Yannick Gerhardt, Admir Mehmedi and Sebastian Jung are injured and they can't play on this match. Josuha Guilavogui is suspended and he is another one player who can't play. All other players are ready to play and all of them are highly motivated for the match. We expect one tough football game with lots of midfield duels and fouls. Both sides play with some oscillating in form and this game is going to be an unpredictable one. Freiburg have failed to win their last 5 matches and their main objective for the match will be strong football in defending. On the other side Wolfsburg also will play very cautious but they will try to score from the first minute. Wolfsburg have failed to win 12 of their last 13 away matches and they have to play much better on Saturday. Wolfsburg have scored at least 2 goals in their last 4 away matches against Freiburg in all competitions. 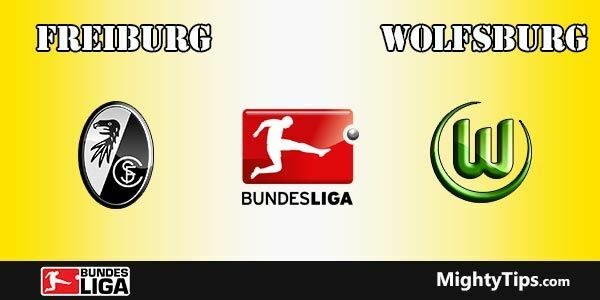 However our prediction and betting tips for the match Freiburg vs Wolfsburg Prediction: Wolfsburg to win. We expect first half time without goals and our second betting pick for the match is X/2. Have a nice betting day and good luck in earning money with our football prediction and betting tips.